“The SNA used to provide training and capacity building to other African countries’ forces because Somalia had professional officers with experience, knowledge, good discipline and integrity. We should celebrate and acknowledge that history and teach it to our children as something which we are all very proud of,” the President said. “Today our forces are engaged on a new front and in another fight, this time against terrorists. The SNA are the lead in the current military operations against Al-Shabaab with the support of AMISOM. The SNA liberates new towns day after day, and people in those areas are now free from oppression and terrorist acts. They are now engaged with the government, they can see the peace dividend and take part in the rebuilding of the nation. We want the people to decide their future through good governance,” the President added. The President thanked the US government for its support to SNA and the rebuilding a professional army in Somalia that can bring peace and stability while upholding the rule of law. 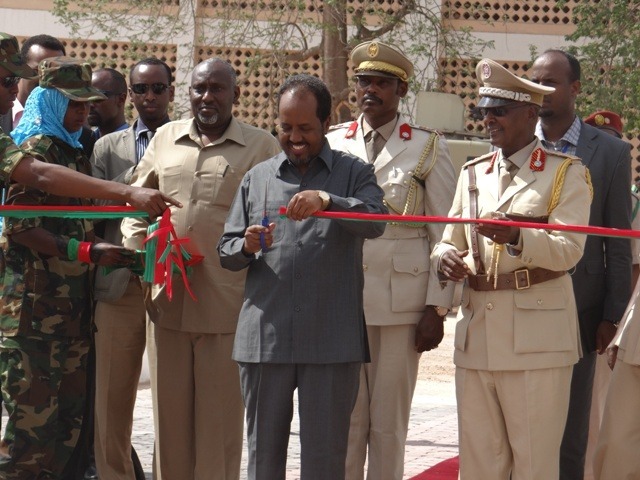 The President encouraged the SNA to continue with its recent successes and to eliminate the threat posed by Al-Shabaab. ‘That way the government can implement its plans such as the stabilization process, the review of the constitution and the implementation of the democratization process so that we can hold fair and free elections by 2016,” the President explained. The President re-iterated his vision to hold fair and free elections by 2016.